Compelling new treatment option for managing glaucoma available now at The Eye Institute. The new iStent inject, designed to help glaucoma patients achieve and maintain lower eye pressures, is available now, according to ophthalmologist and cornea, cataract and glaucoma specialist, Jason K. Darlington, MD, of The Eye Institute for Medicine & Surgery. 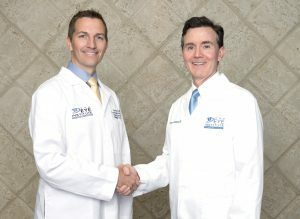 Dr. Darlington, who has performed extensive surgical research for Glaukos®, the company that developed the iStent, explains that this new device is designed to optimize the natural outflow of certain fluids inside the eye – known as aqueous humor – by creating two bypasses through the part of the eye largely responsible for fluid drainage. “By enhancing fluid outflow, we are able to reduce a patient’s eye pressure on an ongoing basis, oftentimes without the need for eye medications or with a reduced number of eye medications,” says Dr. Darlington. Achieving and maintaining reduced eye pressure is the key to maintaining the health of a patient’s optic nerve, thus maintaining their vision, explains James N. McManus, MD, cataract and glaucoma specialist at The Eye Institute. An interesting fact is that the iStent inject stent, at approximately 0.23 mm x 0.36 mm, is the smallest medical device ever approved by the FDA, notes Dr. Darlington. In the key trials leading to the FDA approval of the iStent inject, over 75 percent of patients achieved a 20 percent or greater reduction in unmedicated eye pressure. In terms of the units used to measure eye pressure, this translates into a seven point decrease in eye pressures for this same group. Diagnosing and appropriately managing glaucoma is of the greatest importance, emphasizes Dr. McManus, because if glaucoma is present and not treated, the result can be permanent loss of vision, up to and including blindness. In the early through later stages of the disease, glaucoma is largely asymptomatic. There is no pain and no obvious loss of vision. There is nothing to directly tell a patient that he or she has glaucoma, adds Dr. McManus. Because glaucoma is a progressive and irreversible disease that may lead to vision loss caused by optic nerve damage, it is critical for people to be screened for glaucoma and for them to receive the treatment they need without delay, says Dr. Darlington. “It is estimated that half of the people who have glaucoma are unaware of it, and because of this, they are not receiving any type of treatment,” states Dr. McManus. “If you or a loved one have one or more of the risk factors above, receiving a comprehensive eye examination by an eye doctor may be one of the most important things you can do for yourself and your family,” advises Dr. McManus. Article courtesy of The Eye Institute for Medicine & Surgery.